In 12-inch skillet, cook hash browns as directed on box. Set aside. In large bowl, beat eggs and water with whisk. In 10-inch skillet, melt butter; cook eggs in butter. After eggs are cooked, stir in hash browns and bacon pieces. Add salt and pepper. Place egg roll skins on large work surface. Spoon 1/3 cup egg mixture on center of each skin. Top each with 2 tablespoons shredded cheese. 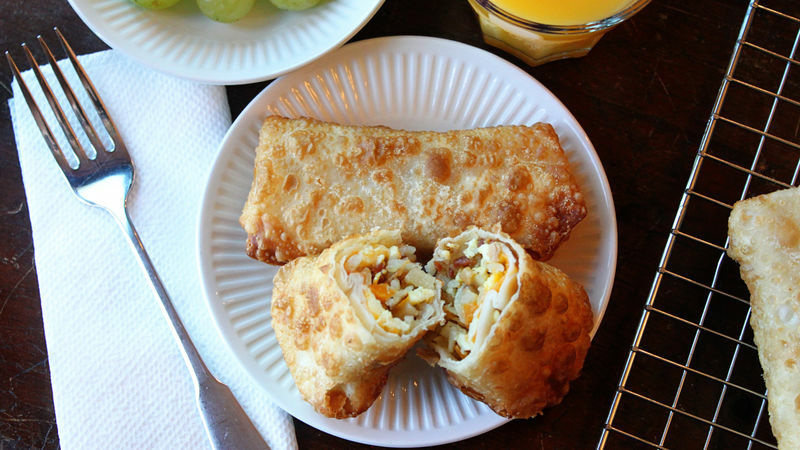 For each egg roll, bring up bottom corner; fold in side corners, and roll up. Bring down top corner; wet with small amount of water to stick. In 8-inch skillet, heat oil until hot. Fry egg rolls in oil until crispy; shake off excess oil, and place on cooling rack to cool slightly. Serve immediately. You can change up the flavor profile by using cooked sausage or ham instead of bacon. You can serve with a dipping sauce like salsa, a cheese sauce or even syrup, depending how adventurous you are feeling!